Yes, four more shopping days until Christmas. Now is the time to come in and buy what we have on the shelf. And, we do not slouch in this category. We still have several bestsellers ready to jump into your hands as you race in today, tomorrow, Friday at 3:55pm (remember, we close at 4pm, but if you arrive before then, we will gladly help you get wrapped books under the tree, because that's the Books on First way). 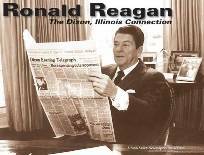 A big local fav is the newest book from Sauk Valley News, featuring selections with its archived collection of photographs of Ronald Reagan and Dixon. We also have from the author of Seabiscuit Laura Hillenbrand, Unbroken: A World War II Story of Survival, Resilience, And Redemption about Louis Zamperini, Olympic runner who gained fame at the Berlin Games and then, entered the Air Force to fight in the Pacific during WWII. After his plane went down and he was one of two who survived on a small raft for weeks, he was captured and tortured by the enemy Japanese who discovered his background. The subtitle says it all. Hillenbrand's detailed research and vivid writing style make history come alive. We have this $27.00 book discounted at 20%. For some intellectual humor, there is David Sedaris's latest title, squirrel seeks chipmunk. You can definitely hear his voice in these short vignettes, ostensibly about birds and animals in humanly familiar situations (a professional groomer baboon finding a way to connect fawningly with a cat client for the big tip, birds talking about their wintering in Guatemala, a mother stork flummoxed by her two-week old son asking where babies come from), but maybe -- just a tiny bit -- these stories are about human behaviour, also. After all, where is the line between animal and humans and aren't humans animals, too? For the serious novel-reader, Ireland-born (now a Canadian resident) Emma Donoghue's Room, is on the short list for the Booker prize. We have this hardcover fiction discounted at 20% off the list price of $24.99. We also have books for growing children of all ages, like Legendary Journeys: Trains.